Thanks for being so patient while I moved into my new apartment and got settled in! Sorry for the sporadic updates, everyone! Thanks for stickin’ around! Oh Luci, you should have planned ahead. Oh Lucy. You really *are* a goober. I ship Vet and Autumn! This whole chapter has had me on my toes! My first webcomic, and I love it! 1st reaction – Yay! Finally a new page! 2nd reaction – Yasss! Lucy is here!!! 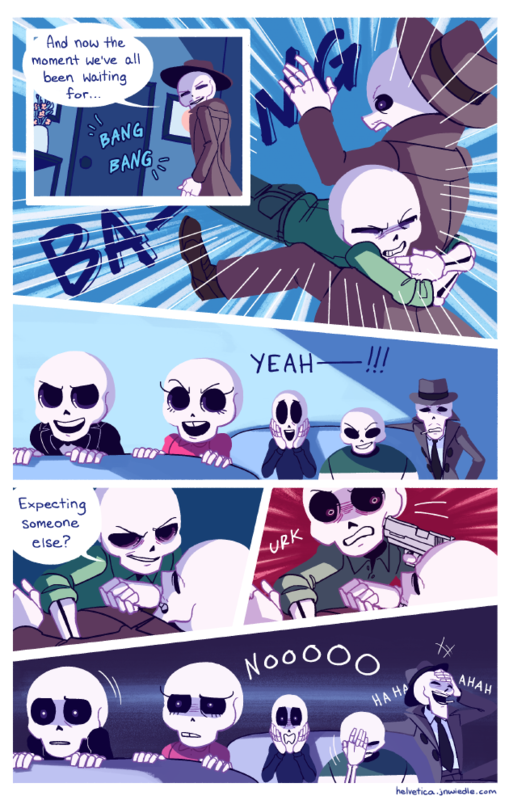 3rd reaction – Haha, take that, stupid skeleton! 4th reaction – Dude -.- Im facepalming. and they’re skeletons without any vital organs, your point was? im crYING, their faces in the last panel!! also wanted to add, i love your art style! you were so cool Lucy…until you let the guy get the drop on you. Way to go, over cocky detective. WHY U NO BRING UR OWN GUN?? Lucy has a gun in his right hand. I’m calling it. His right hand was never shown. Did he just broke or at the very least, leaned on the 4th wall? Yay Lucy.. Wait… uh oh. Hopefully Lucy has a gun in his right hand. So suspenseful! I came back just to reread this part; STILL FAVE. LUCY YOU IDIOT I ADORE YOU.